We have a different theme in pretty much every room of our house. For instance my kitchen is a country kitchen theme, and our living/family room is a wildlife/hunting theme. Like we have real deer head mounts on the wall and coordinating camouflage decor to go with it. And that's probably what lead me to picking out this awesome canvas print. It's a beautiful elk walking through the woods at sunset. My husband has always said he would like to hunt for elk so I thought it would make a nice addition to our decor. Plus it fit just perfectly between my wall sconces which to me was a sign it was meant to be! When you order a canvas print from Photowall it comes rolled up along with the wooden frame pieces. You have to stretch out the canvas print and then lay the frame on the back of it yourself to assemble it. My husband and I did it together one on each end of the frame and it honestly took us less than 10 minutes to put it together and have it ready to hang. Super easy directions and yes it can be done by one person. We just did it together to save time and get it up on the wall quicker. I am really quite impressed with the quality of the print and how nice it looks on our wall. Definitely a beautiful piece. They have tons of photos to choose from on their website, or you can even upload your own photo if you have one you're super proud of and have it turned into a canvas print too. Photowall also offers wall murals in stock and custom prints if you prefer them over canvas prints. We are a Swedish company with a passion for design and quality. 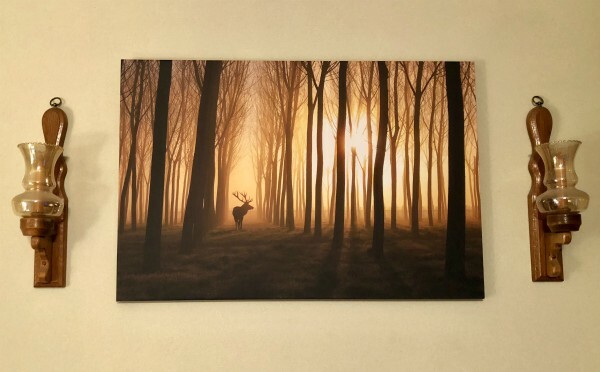 Our wall murals and canvas prints are environmentally friendly, fire-retardant in accordance with Swedish standards and do not fade in sunlight. All our motifs are selected with care.